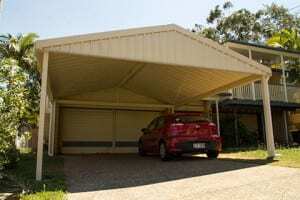 Brisbane Patios is a specialist carport builder, installer and renovator. Leaving your car out in Brisbane’s weather can lead to premature ageing and damage which can decrease in the value of your car, parking your car undercover will prolong the life of your car, keep it clean and reduce the risk of damage. Carports can greatly vary in design and style, ranging from Flat/Skillion Roofs, to Pitched/Gable Roofs as well as various others. Most Carports will require a DA (Development Approval) permit from the council, which we can arrange for you. Brisbane Patios have a carport to suit any budget or style, including timber period carports. We offer a great range of colours and designs so that your new carport is sure to fit right in with the design of your home, we have a range of carports that are great for caravans, boats, motorhomes and large and/or long vehicles. We build our carports with the same construction materials as our patios, using our high gloss materials and even insulated roofing. 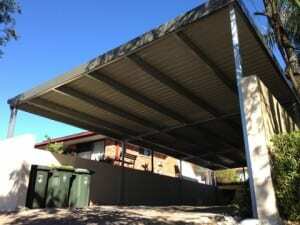 All our carports come with a 10 year structural and 10 year workmanship guarantee. This combined with the quality materials we use allows you to be sure that your new carport is built to last. Trust us to build your carport and you’ll be the proud owner of a good-looking, long-lasting carport design that will add value to your home and protect your car. Brisbane Patios is a specialist patio/deck builder and installer offering a complete range of decking, patio, roofing and maintenance services from initial concepts and design, a professionally managed build process and a thoughtful site clean up, to leave you with an amazing result that we know you'll be delighted with.